December was the month for which the last version of PHP 5.6 series had support for regular bug fixes. From now on only security bugs will be fixed. This was one of the main topics discussed by Manuel Lemos and Arturs Sosins on the episode 79 of the Lately in PHP podcast. 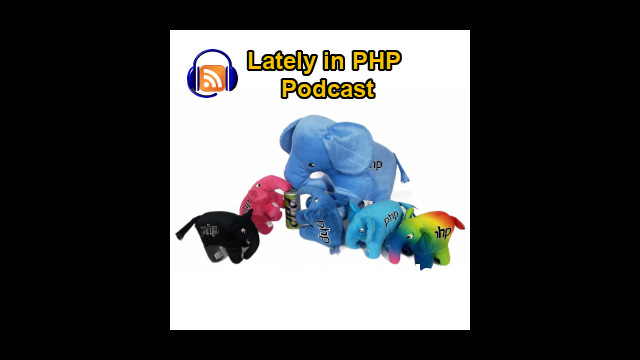 In this episode they also talk about an article that shows the whole evolution in terms of performance since PHP 5.0 through PHP 7.1 and PHP 8 or 7.2 version, as well the usual proposals for the next PHP version like magic casting, decorator classes, throwable error code types, C# property like accessors, etc.. This article also contains a podcast summary as a text transcript and a 7 minute video. This month we are going to do, as usual, starting with the topics related with the latest versions of PHP. PHP 5.6 end of the life was reached but there was one last version in December. So it will enter in the security only fixes from now on. I just want to add one on one more think about it I just noticed under standard. There is HTTP stream wrapper should ignore HTTP 100 continue code. I think we actually discussed about this in some previous podcast when somebody complained HTTP stream wrapper does not support HTTP 2 protocol. So I think this fix is related to it. They are listening and they're fixing, nice. I thought they would to be doing that for future versions but OK. That is also fine. Anyway there was yet another PHP 7.0 release and there was the first 7.1 release. It was not yet an update but there will probably be one soon, one each month. We already talked about PHP 7.1 release but there are other things that are important to know. I already mentioned the end of life of PHP 5.6. There will be still 2 more years of security fixes support. So don't panic but I already heard people complaining that their hosting companies have forced them to upgrade to PHP 7.0. It seems somebody already panicked but well that's the way it goes. Anyway moving on we have an article that we already mentioned last month but this time we are going to take a look at it closer, which is an article about how the PHP performance evolved over time at least since PHP 5 and we'll be talking about also what improvements happened in these versions to explain a why the performance improved. Next we are going to start to talking about the usual set of proposals for the next PHP versions. I will talk first about a concept that is being proposed, I don't know if it is going to approved but ok it is a bit confusing but they call it magic casting which would allow to cast objects from one type to the expected type in PHP 7 by calling a __cast function. It's a bit confusing how it works we will get back to this when we talk about this proposal. Then we have just a RFC that somehow is basically a proposal to update the documentation about error codes of throwable errors and basicaly this to mention that some error codes could be usually numbers but could also be strings. So this is probably more as a documentation update than an actual feature. Then we'll get back to an old proposal that did not pass in the past. It's like people vote on proposals and then they get back to them a later a few months when they fail to pass in the previous time. May be somebody agrees, maybe somebody changes their mind but this one is specifically about property accessor syntax which is actually somewhat inspired in .NET to define our variables of class can be set using functions defined inside a class. Then there is a proposal, a RFC which which is also a bit hard to understand because you need to know how PHP works a bit internally for instance when you establish a database connection it returns a resource value which is an integer but they want to make it an object, they call it Hash Context. It's either this or I'm not understanding this feature but will get back to this ahead. Then finally we'll talk about a proposal for what is called decorated classes. These classes are to follow the decorator pattern which is usually implemented with a subclass that defines functions that maybe called before and after another function that is being decorated. So the proposal is to add a new keyword called decorates to make it more explicit that this is a decorator pattern.